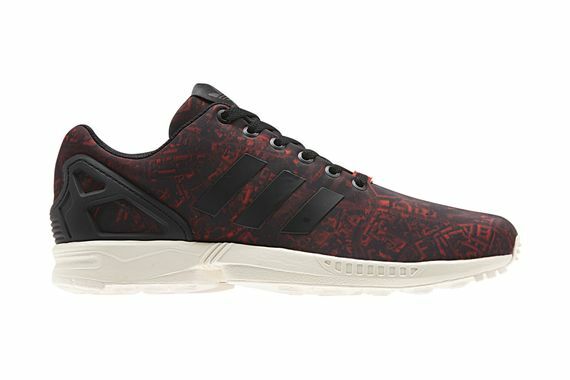 adidas Originals ZX Flux "Moscow"
The city pack we previewed a while back is coming to fruition, and these “Moscow” joints are like Putin himself, nothin’ to be messed with. The red/black upper looks dark from afar, but the graphic nature depicting the city, up close, is a sight to see. Hard to believe the Russians approved that, but maybe even the Kremlin is feeling the adidas takeover. You can cop yours via a pop up shop aboard a boat docked in the Russian harbor near Muzeon Park, or if you’re trying not to deal with all that head to the three stripes flagship stores in Berlin and Shanghai. Stay tuned to MN for the latest on these and other pending releases.